Manaslu Tsum valley trek is the combination of two beautiful treks Manaslu circuit trek and Tsum valley trek. It is a longer trek for the people who would like to explore more remote part on northern Nepal. Tsum valley just few couple of minutes away from areal route but the place is still very remote. 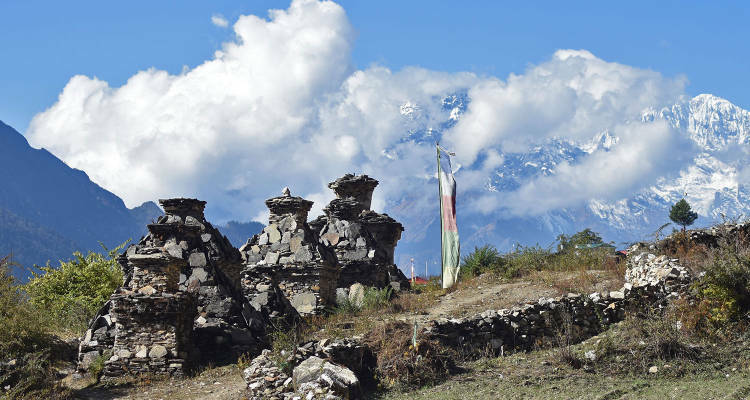 There are beautiful villages to see and visit, old monasteries and a cave where Milarapa had mediated (one of the main Tibetan Buddhist) on the other hand Manaslu Circuit trek is a great place to see the views of Himlayan ranges and glacier and nature. Manaslu tsum valley trek starts with a 8 hours long bus ride from Kathmandu or Pokahara. Starting of the trek we will be walking low altitude which is around 800 meters to 1400 meters. 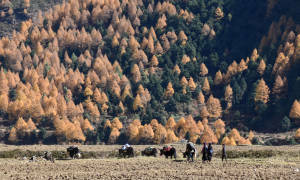 The trekking valley is narrow before getting to the first part of the trek to Tsum Valley, it is also area where no killing of animals are allowed. This part is culturally very rich with lots of cultural history and cultural monuments. Chortens, mani walls, monasteries, prayer flags and also has lots of stone carved in beautiful farming lands. You will not only see the old monasteries built thousand year ago but cave where Milarepa (one of the high monk of Tibetan Buddhism). The area is isolated and the houses you will see here and in Manaslu area are mostly made of stones. 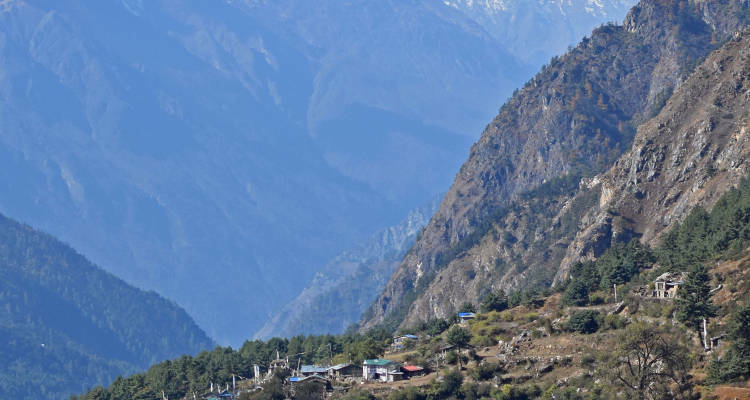 Manaslu trekking area is another part which is much more scenic than Tsum though both have their own beauty but it will be great experience to combine the culture with nature and that is why this itinerary particularly is great place to trek and with out a doubt this place brings smile after trek. Here is also a blog about the Manaslu Circuit Trek written and suggested by various travellers. Starting point: Kathmandu bus station. Ending point: Pokhara or Kathmandu bus station. Best season for trekking: Trekking March to mid of June and October to mid of December. Total trip days: 24 days, 19 day trek with two days drive, 3 days in Kathmandu. Walking hours: 6 hours on average. 7- 8 hours some days. Trekking difficulty: 3 and half out of 5. Accommodation in Kathmandu: 2* Hotel/ 3nights, (Hotel upgrade available in client’s interest). Highest point of the trek: 5140 meters/ 16860 foot. Highest peak view: Manaslu (8156 meters). People in the trek: Chhetry, Gurung and Bhotes. Trek next to the world’s eighth highest mountain Manaslu (8156m) and the glacier. Trekking over the Larkya-La Pass (5130m) between two peaks Larkya (6219m) and Cheo Himal (6820m). Visit to one of the sacred place for Buddhist in Tsum Valley where Milarepa meditated and the nunnery monastery believed to be 1000 year old. Least trekked part of Nepal with great views. Day 02: Kathmandu sightseeing: World Heritage sights: Pashupati Temple, BouddhanathStupa, Patan Durbar Square and Swyambhunath (Monkey Temple) Hotel. Day 04: Arughat to Soti Khola (710m), 4 hours, 100m uphill. Day 05: Soti Khola to Machha Khola (900m), 5-6 hours, 200m uphill, lodges. Day 06: Machha khola to jagat (1410m), 6-7 hours, 540m uphill, lodge. Day 07: Jagat to Lokpa (2240m), 7 Hours, 900 meters up hill, Lodge. Day 08: Lokpa to Chhumling (2390m), 4 Hours, 250 meters, 400 meters up Hill. Day 09: Chumling to Burji (3100m), 5 Hours, uphill 600 meters. Day 10: Burji to Mugompa (3800m), 4 Hours, uphill 700 meters. Day 11: Mu Gompa to Chhekumpar (3100 meters) 4 hours, uphill 700 meters. Day 12: Chhekumpar to Lokpa (2240 meters) 6-7 hours, 120 meters uphill, 1300 meters downhill. Day 13: Lokpa to Ghap (2000 meters) 4 hours, 320 meters downhill. Day 14: Ghap to Lho (3180m), 6-7 hours, 1210m uphill 280m downhill, lodge. Day 15: Lho to Samagaun (3520m), 4-5 hours, 550m uphill, 220m downhill, lodge. Day 16: Samagaun Acclimatization Day. Day 17: Samagaun to Samdo (3850m), 3hours, 330 uphill, lodge. Day 18: Samdo To Dharmasala (4460m), 4-5 hours, 610m uphill, lodge. Day 19: Dharmasala to Larkya-La Pass (5130m) then to Bhimthang (3730m), 8-9 hours, 670m uphill,1400m downhill, lodge. Day 20: Bhimthang to Gowa (2515m), 5-6 hours, 1370 downhill, 180m uphill. Day 21: Gowa to Tal (1700m), 5-6 hours, 700m descend, lodge. Day 22: Tal to Jagat/ (1300m/1100m) then to Beshishar by Local Jeep, 3-4 hours, ascends 110m, descend 400/600m, and lodge. Day 23: Beshishar to Kathmandu Drive for 6-7 hours. 01: Accommodations in twin bed Sharing BB plan basis in Kathmandu for 4 nights. 03: Tea house lodge during trekking days. Most of the tea houses are basic standard but we provide the cleanest and comfortable one. 04: Transportation by Local bus from Kathmandu to Arughat and Jagat to Kathmandu, Private Jeeps are available in client’s interest. 05: Guide and porter for the trek. 09: All official document process charges/ Annapurna Conservation Area Permit, Manaslu conservation Permit, Tsum valley Permit, TIMS card for trekking. 10: Insurance, Transportation, Wages, Equipment’s and all meals & Lodges for the trekking staff. 11: First Aid Kid Box (for Normal Treatment only). 13: Government taxes & Other Applicable Fees. 01: International Airfare to and from your country. 02: Nepal Visa entry fee please bring enough 5 passport photos. 03: Travel & Health Insurance – Emergency Helicopter Rescue Insurance (Most recommended). 04: Lunch & Dinner in Kathmandu. 05: Extra accommodation in Kathmandu in case of early return from trekking than schedule itinerary. 06: Any kind of drinks during trekking such as Alcoholic Drinks, Cold Drinks, Boiled & Mineral Water, Beverages, tea, deserts in trekking. 07: Tips for Guide & Porter after completing the trek. 08: Hot Shower, Battery Charges (Available in Trek with Extra cost or Free in some lodges). 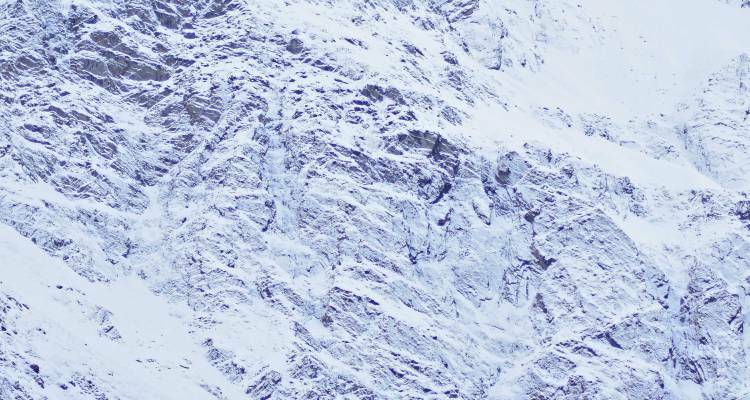 09: Unforeseen Cost such as Flight Cancellation or Delayed, Sick during trekking, and Helicopter rescue in trek. 10: Cost due to bad weather etc. which is out of our control. 11: Personal expenses such as the phone calls, laundry service, internet, bar bills, any other cost which are not mentioned in above will be paid by the clients themselves. Due to bad weather during winter (January /February, winter and July/August monsoon season, the flights can be cancelled or delayed for few days so we advise you to have few days extra if you are planning for mentioned season, but we still advise you to have extra days for other seasons too, as the weather in here keeps on changing. Do note: All people out who is willing to do the adventure, you guys need to attain a basic level of fitness. We would suggest warming up for the trip at least two months before the trip by jogging for an hour or hitting some weights. 08: Are the flights to any part to Manaslu circuit? No flights are there for Manaslu Trekking area, trekking starting points are reachable by driving only. Option of taking helicopters are available for private flights. We highly recommend you get yourself insured for the trip. We recommend “world nomads”. Do ensure your insurance policy that applies at an altitude of 6300 meters above sea level, and covers accidents, emergency medical costs and evacuation including helicopter evacuation and theft or loos of belonging or trip cancellation. The reason we advise this is because if something untoward happens sometimes the best way to get out quick is in a helicopter which can be very expensive if you are not insured. International flights operate regularly everyday to Kathmandu. By road from India we do have open borders in east west and south and from China the border from Zangmu or Khasa righ now the road from Lhasa to Kathmandu is blocked by land slide. For private group we make trip private but if people are there who would like to join then we will look for a possible group joining people if there is any. A maximum of 15 and a minimum of 2 people are advised. For more than 6 people we provide two guides and for more than 12 people in a group 3 guides are provided. Do I need to carry my luggage myself or will there be porters to carry my bag for me during the trekking days? We would recommend a haversack or a trekking bag which should be 90 liters or more and we provide 1 porter for two people. During spring and summer (March- June the temperature in the trek from 0 to 28 Degree at day time depending on the heights and 0 to -10 at night depending on heights. 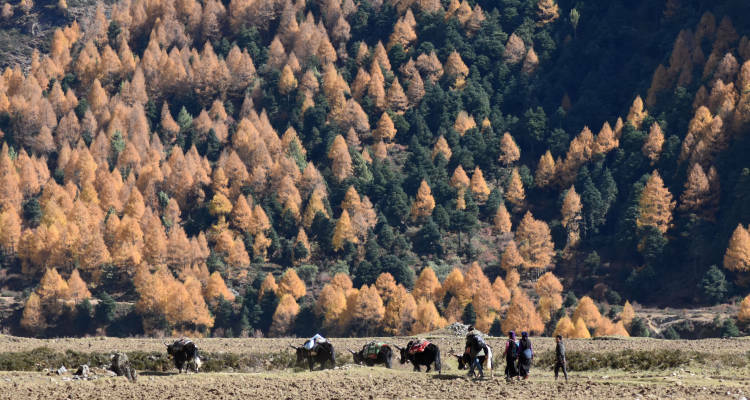 During October to February the temperature is cold, during day temperature is normal but night is freezing cold above 2500 meters. The trip ends in Kathmandu where you can fly or drive in. However we highly recommend you keep a or more buffer day. We can arrange an extra night stay for you in Kathmandu. Going down will be quick and as you have already acclimatized. Lots of up hill and long down hill is frequently done. We will arrange all the paper work needed for trekking permit. All you need is the passport, visa on arrival at Kathmandu airport and insurance copy. Non- Indian passport holders, we shall arrange all permits inside Nepal. Visa for western clients are available on arrival in airport but this takes quite some time so if you already have visa from your own country you wont have to line up in queue for long. To Indian nationals visa is not needed. Payment for flight, permits and hotel should be paid in advance so we suggest earlier the better. Advance payment of 30 % of total six month before arrival to insure the bookings for trek. Please ask if the bank charges for the transfer and in such charges the clients should the liable charges.